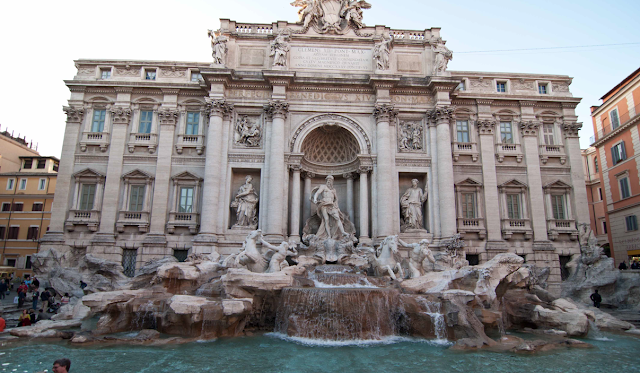 Italy - Rome and the Amalfi Coast ~ Learn, Live, and Explore! 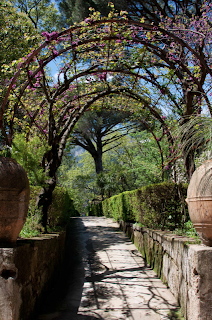 My April trip to Italy was a combination of something new and some unfinished business. The new aspect was traveling farther south in the “boot country” than in previous visits to explore everything the Amalfi Coast had to offer – staying in both Sorrento and Positano. 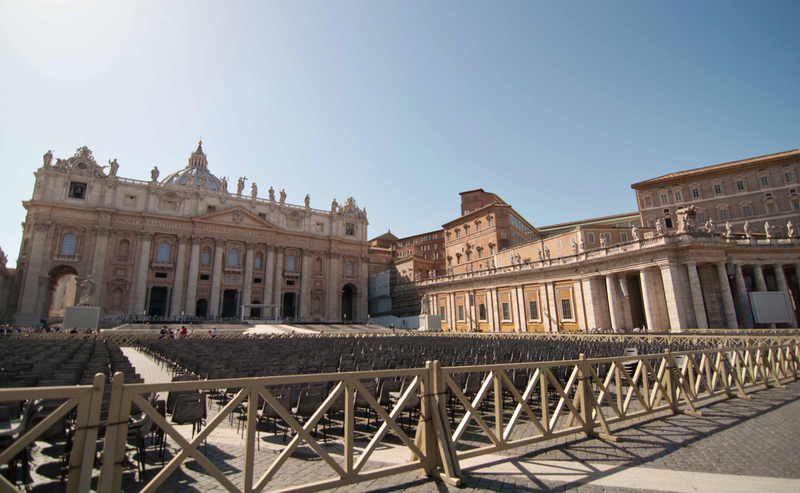 The unfinished business resided in Rome because, being completely unaware of the Catholic calendar the last time I was in the city, I mistakenly planned on touring the Vatican on one of the worst days of the year – Palm Sunday! I remember waking up early that morning to grab the metro and wondering why the metro was so busy on a Sunday morning, then why everyone was getting off at my stop. I realized my mistake once I saw all of the vendors selling palm crosses. On a positive note, I did see the Pope (John Paul II) deliver the holiday mass, but recognized that someday in the future I was going to have to return to Rome – not that I’m complaining. 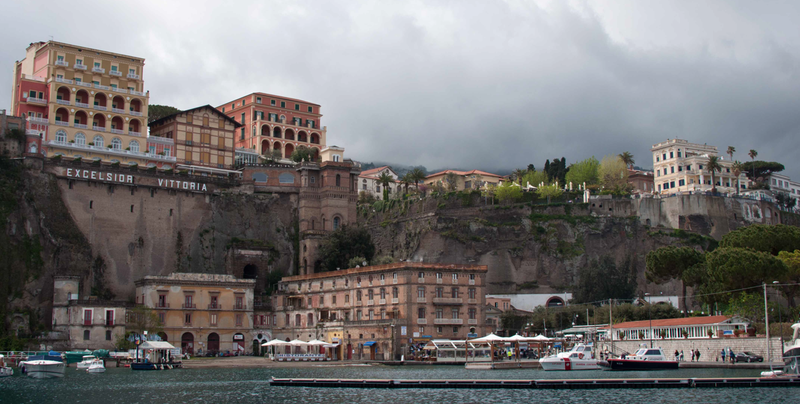 To get to Sorrento, it took a little train coordination, but nothing too challenging. 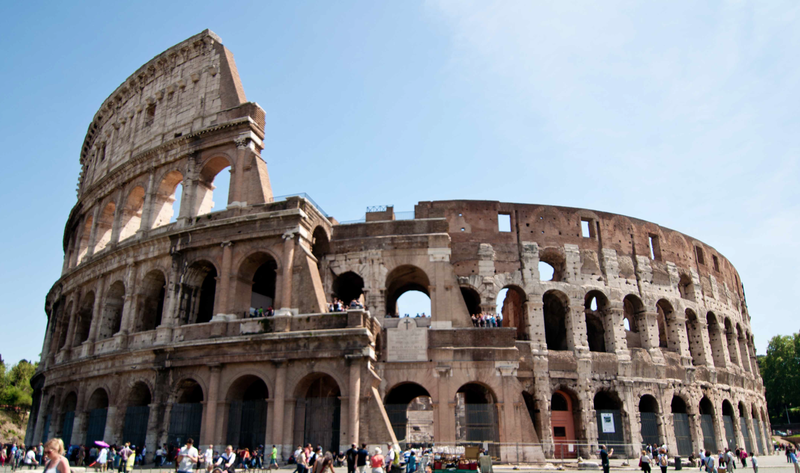 When we arrived at Roma Fiumicino airport, we followed the signs to the train station and proceeded to purchase two ticket to Naples (Napoli Centrale) via Roma Termini. You can purchase these in advance as well on the Trenitalia website, but we were not sure our flight would be on time and did not want to commit to a specific ticket time. So, instead, I chose to pretend like I knew how to speak italian and purchased at the ticket counter - "Due biglietti per Napoli Centrale per Roma Termini, per favore!" 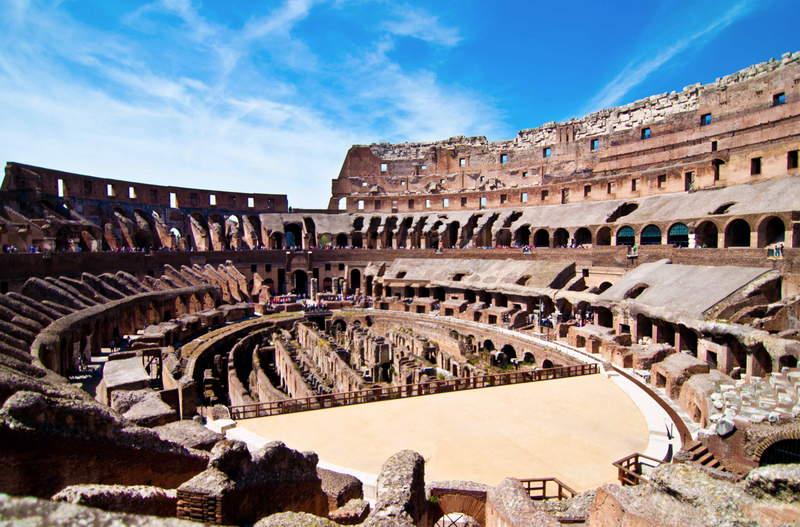 Changing trains in Rome was a snap, and we got to enjoy a little downtime and fantastic panoramic views of the countryside from our seats for an hour and a half. At Naples, we had to switch to the local train, Circumvesuviana, and the ticket was very cheap - just a few euros. Finally arriving in Sorrento, we fortunately only had a short walk to our hotel in the central part of town. That night, I had the most amazing pizza topped with olive oil, garlic, basil, and some of the sweetest tomatoes - my Italian genes were very happy! 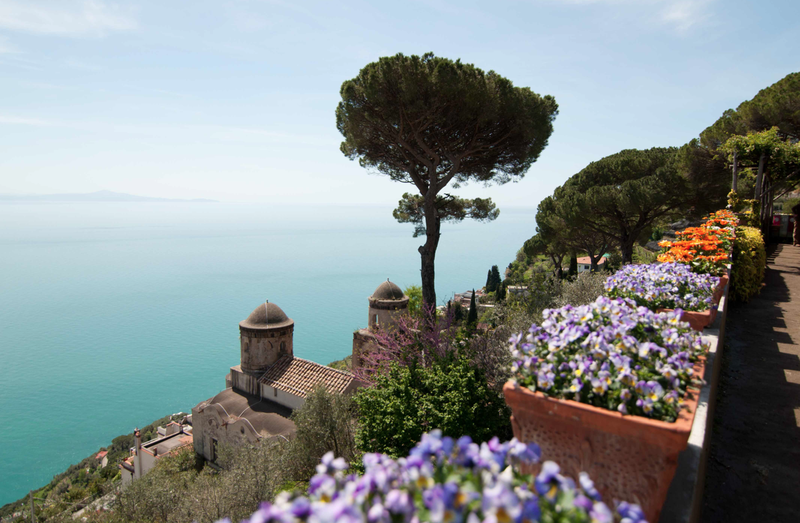 You really can’t go wrong with food in Italy, or the fact the people of the Amalfi Coast are obsessed with lemons! 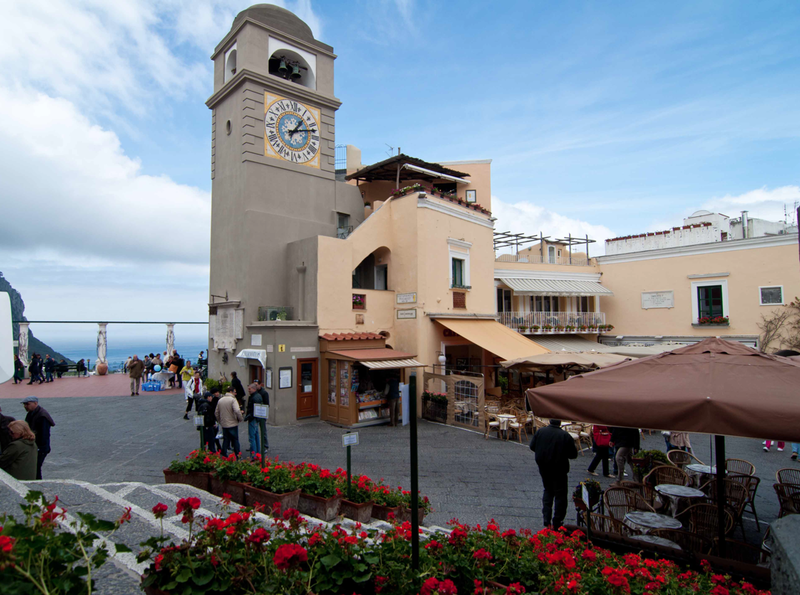 Sorrento is a great base for exploring two popular area attractions: the island of Capri and the excavation of the ancient city of Pompeii, frozen in time so many years ago. Ferries leave the port of Sorrento for Capri about twice every hour, but check the most current schedule. 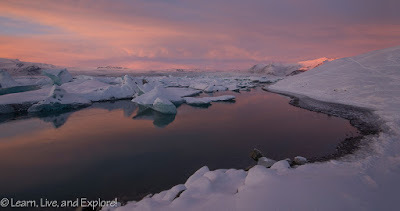 The day we left, unfortunately, was not ideal for sea travel. Somehow we survived without getting terribly sick, but I can’t say the same for a large percentage of the ship! The entry port, or Marina Grande, is not the place to spend your time while on the island, as it is full of bad restaurants and cheesy gift shops. 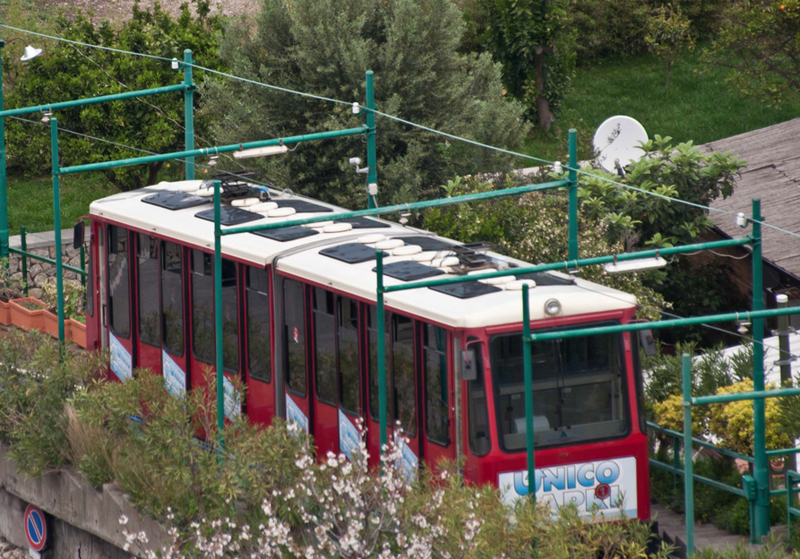 Instead, purchase tickets and travel up the hill on the convenient funicular (funicolare in Italian) to the island’s main point of interest. There really is no suggested way to explore the small streets in the town atop the island, just start walking. 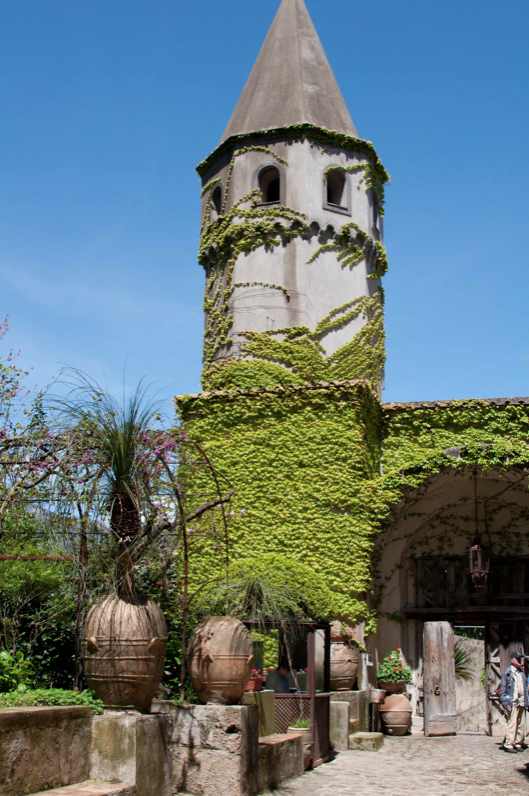 There are gorgeous viewpoints to be found, delicious restaurants to try, and expensive designer shops to peruse, especially near the fancier hotels. 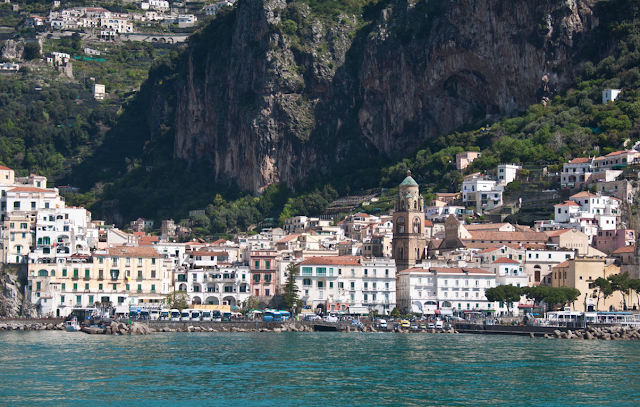 On any other day, when the seas are less rough, another popular activity on Capri is a boat trip to the Blue Grotto. The day we were there, there was nothing that could convince me to get back on a boat, especially a small one, unless that boat was the one back to Sorrento. 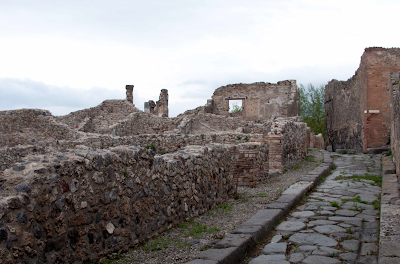 Pompeii is also very convenient to Sorrento, just a 30 minute northern bound train ride on the Circumvesuviana line that we took from Naples. Buried in 79 A.D. by ash from Mount Vesuvius as deep as 20 feet, it was rediscovered in 1749 and has taken several excavations to unearth and restore only a large fraction of the original town. Lack of air and moisture preserved a lot of the essence of what life was like in the Roman era, including frescoes, political campaign paintings, mosaics, architectural features, and city layouts. 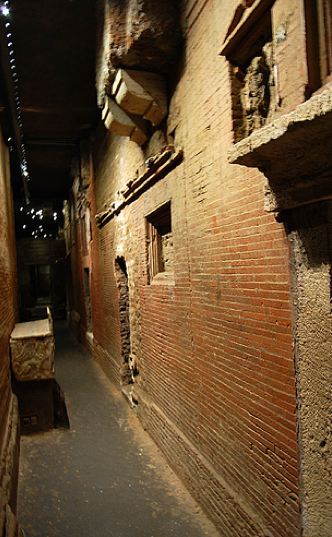 Today, you can tour long streets of shops and homes, ruins of the small and large amphitheater, the large bathing complex, and many more features of this once large and prosperous port city. 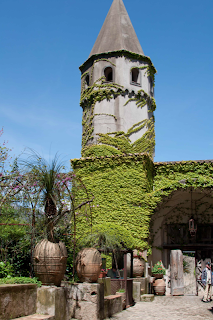 As a tourist, you have the option of purchasing an audio guide, but we chose to join a group tour led by a guide in order to be able to ask as many questions as we wanted. The cost of the group tour was just 10 euros, so not much more than the audio guide. 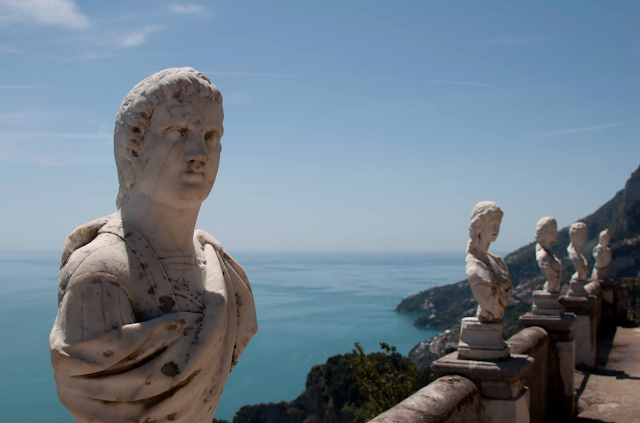 To get to our next destination, we were going to take the thrilling, winding coastal road from Sorrento to Positano on the blue SITA bus, but Europe being what it is - a little trickster up to no good - a mudslide halted all bus service between the two towns. We had no other alternative than to hire a car for 70 euros, a drive that took us past this alleged “mudslide” that was simply a pile of rocks no bigger than a couple shot puts! Honestly, I was not too upset by our forced mode of transportation switch because when we reached Positano, we realized that it would have been quite the challenge to find our hotel along the long, one-way twisting and steep road down into town. 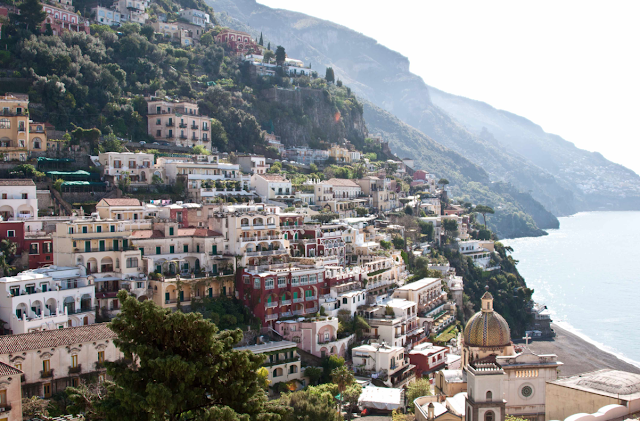 While in Positano, we spent a lot of time just relaxing and enjoying the picturesque town, including drinks on the beautiful balcony of the luxurious Le Sirenuse Hotel, also one of the settings for the classic 1990s “rom-com” film, “Only You,” starring Robert Downey Jr. and Marissa Tomei. 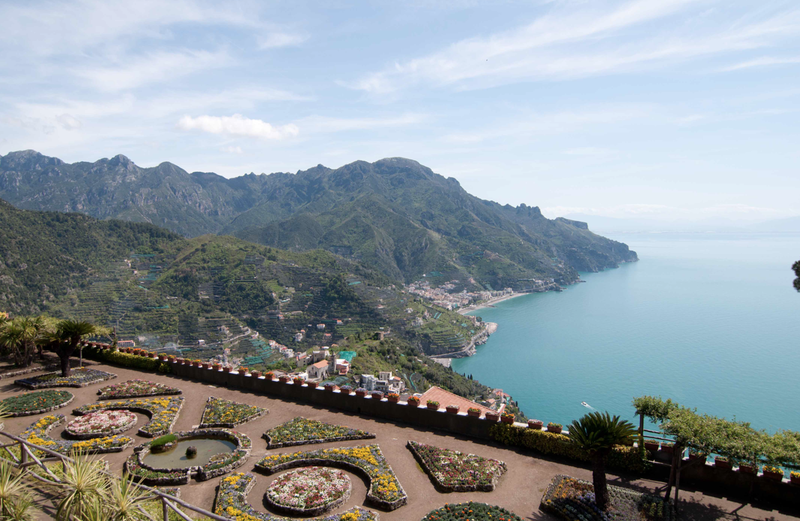 We also took a ferry over to the town of Amalfi, a beautiful boat trip in itself, then grabbed a bus up the mountain to the small town of Ravello, home of some of the most breathtaking views on the Amalfi Coast. 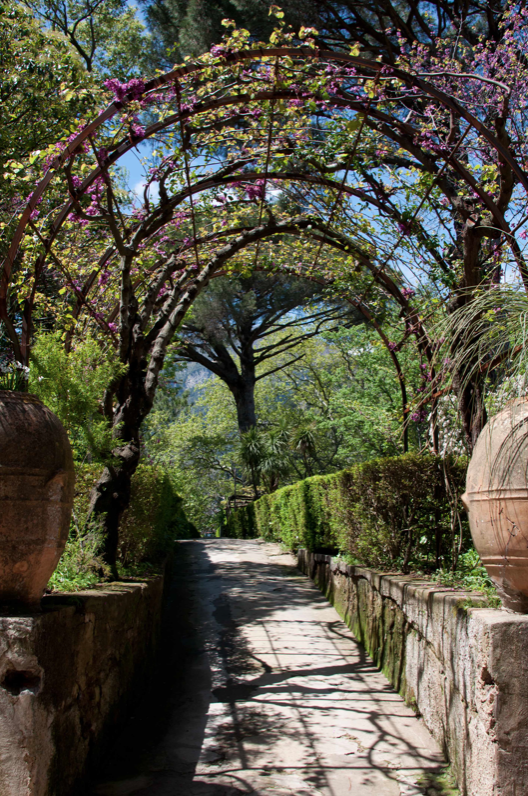 Check out both Villa Rufolo and Villa Cimbrone (pronounced cheem-bro-nay) and their gardens – both well worth the entrance fees. While in Ravello, we also ate at a well-known local restaurant, Cumpa Cosimo. 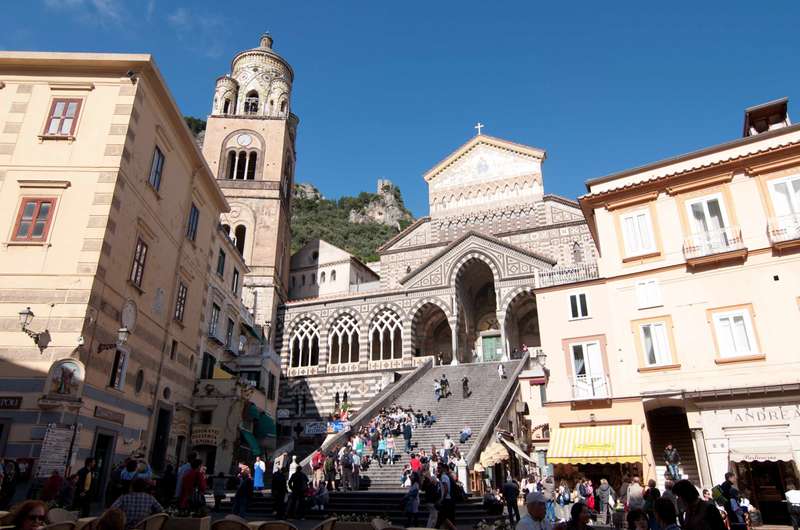 Back in Amalfi, we were able to tour the large church and grab our daily gelato before having to board the last ferry back to Positano. To kill some time before we were joined by another person later that day, my friend and I opted to take a free walking tour to get a feel of the city. 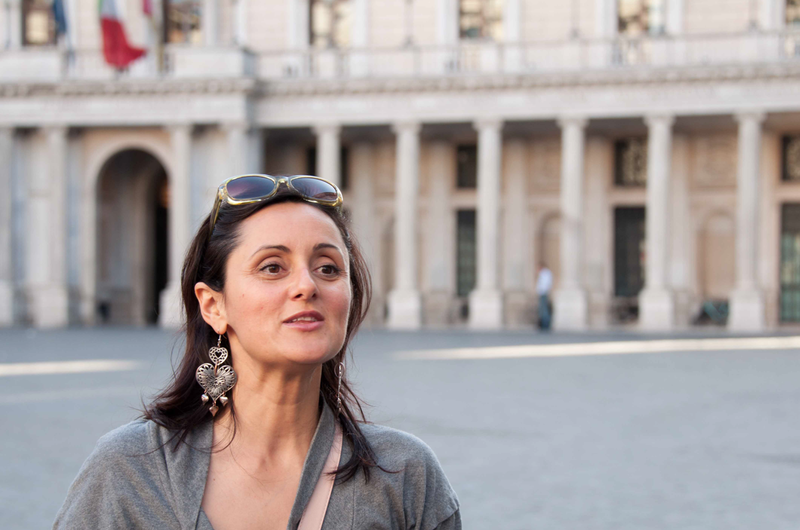 If you've read my other travel posts on Europe, you shouldn't be surprised that I sought out a free walking tour. I just love them as an orientation tool! 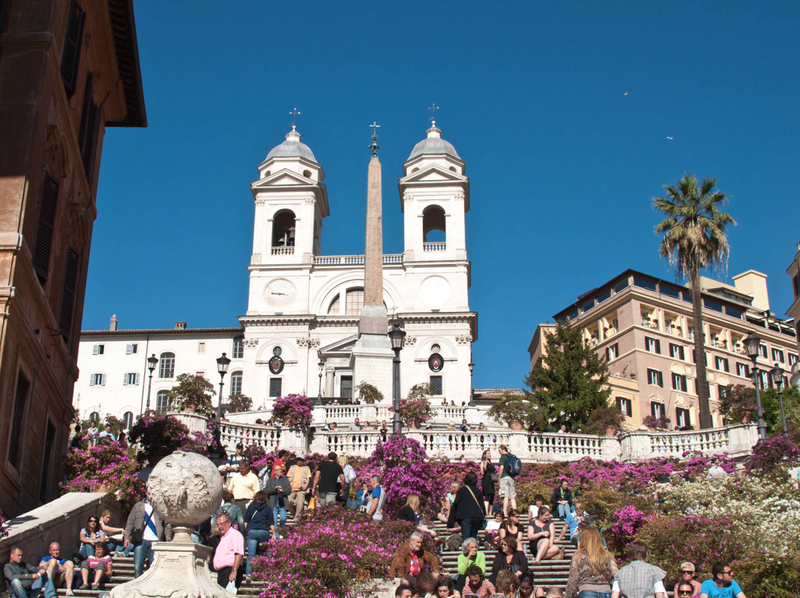 This time, we selected the New Rome Free Tour, led by a Selma Hayek look-a-like, that took us on a path that started at the bottom of the Spanish Steps and covered: the Immaculate Conception Column; house of Gian Lorenzo Bernini; Saint Andrew Church and its two Bernini angel statues; column of Marcus Aurelius; the Prime Minister's house; Pantheon; Saint Ignatius Church and its faux dome - a 21m diameter painting of a dome by Andrea Pozzo, a tromp 'loeil or trick of the eye; and concluded at the famous Trevi Fountain. That night, we ate at a local restaurant suggested by the manager of our accomodation, Tratoria Pizzeria Gioia Mia on Via degli Avignonesi near the Trevi Fountain. Friday, we had tickets for the necropolis tour at the Vatican in the early afternoon, so we made our way over to Vatican City in the morning in order to run through the Vatican Museum, finally completing my one goal for this trip to Rome. 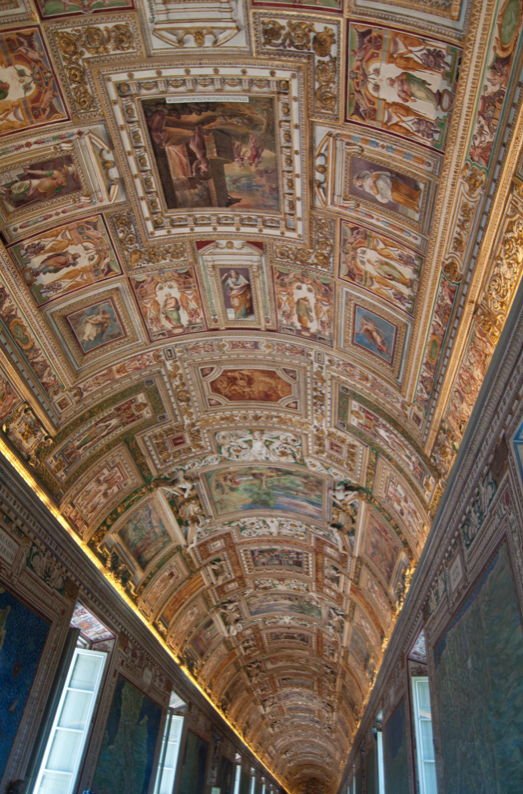 If you suffer from any level of agoraphobia, the Vatican Museum is not for you! The crowds were intense, and it wasn't even the peak of tourist season! The flow of crowd movement was restricted by small door spaces between rooms, so several times I found myself slowly shuffling from one door log jam to the next. 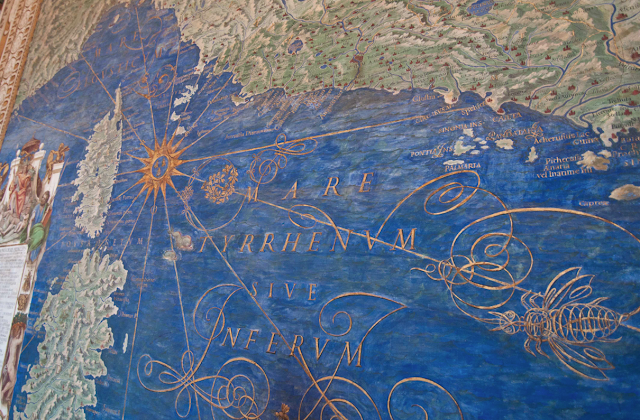 My favorite room in the Vatican, hands down, was the long hall, aptly named The Gallery of Maps, that had colorful maps painted on the walls and a collage of small paintings covering practically every inch of the ceiling. 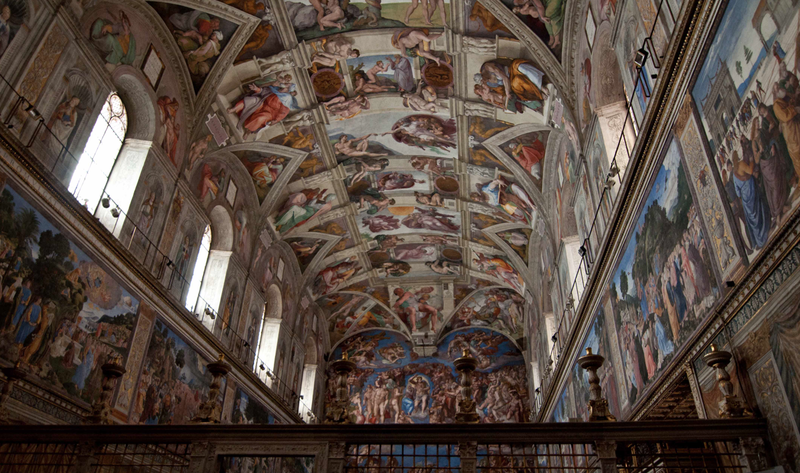 Second favorite room, of course, contained Michelangelo's masterpiece in the Sistine Chapel. After surviving the crowds of tourists, we headed through St. Peter's Square to reach the opposite side of the basilica to, then, go through security and arrive at our meeting point for what I considered the highlight of our time in Rome - the underground tour of the Vatican excavations of an early Christian Roman necropolis (translated: city of the dead!). 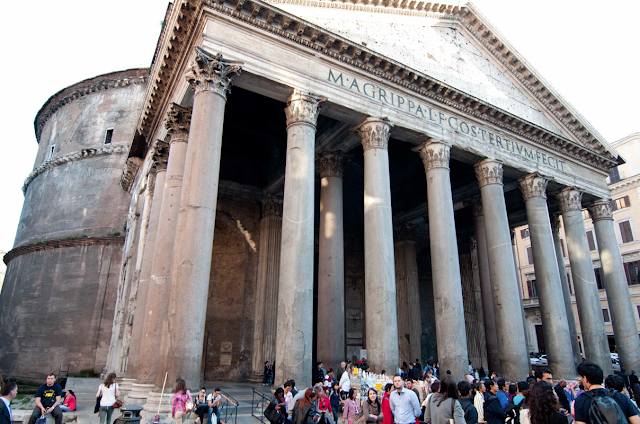 For only approximately $17.50 US, you can escape the crowds above ground and join a small group tour of around 10-12 people to view the final resting place and bones of St. Peter. In addition, you will see many excavated mausoleums of wealthy Christian families dating back to the 1st through 3rd centuries that comprise what is called the Scavi, or a necropolis, directly beneath St. Peter's Basilica. The Roman mausoleums contained within this Pagan cemetery are well preserved, considering their age, because they were completely filled in by Emperor Constantine in the 4th century in order to create a foundation for the apse of his church dedicated to Peter on Vatican Hill, what would later become St. Peter's Basilica. In fact, you can see the original Constantine altar that forms the base of the current altar in the church above. 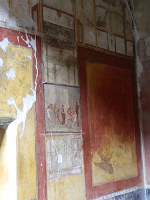 It is below this altar that what was thought to be Peter's tomb resides, next to a red walled memorial. 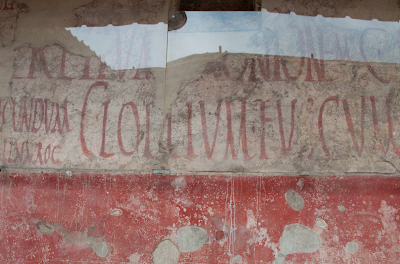 It was discovered in the late 1930s/early 1940s, during the first period of excavations of the necropolis, that the tomb next to the red wall actually contained the bones of two males and one female. All three skeletons were ruled out as the bones of St. Peter. 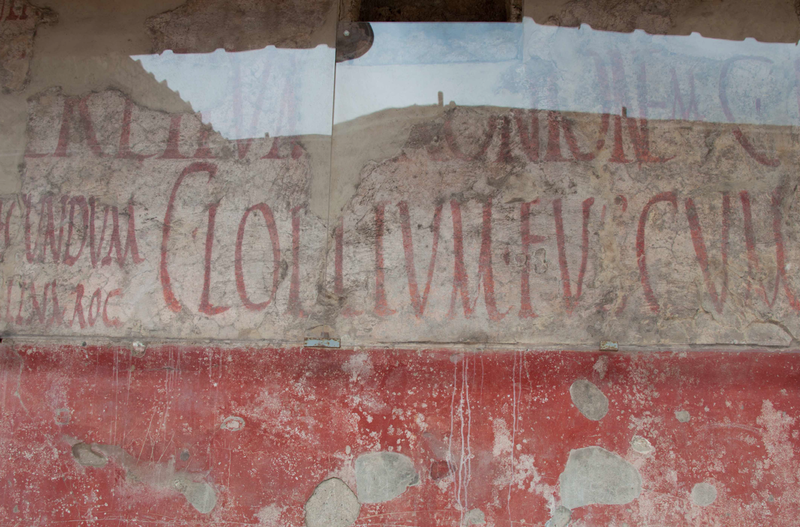 In 1942, the bones of a male were found in a box placed within a niche in, what is called, the graffiti wall, due to its many etchings thought to be carved by early pilgrims and to depict symbols that are thought to say "Peter is here." It wasn't until the 1970s that forensic tests concluded the 19 bones found are those of St. Peter. 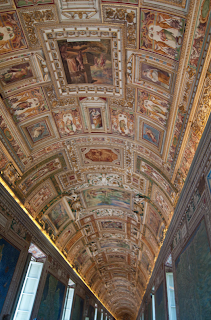 The bones, well 18 of them as one was moved to the Pope's chambers, have now been placed back into the graffiti wall, albeit in a clear box (rumored to be created by NASA) so that visitors can safely view them without compromising their structural integrity. 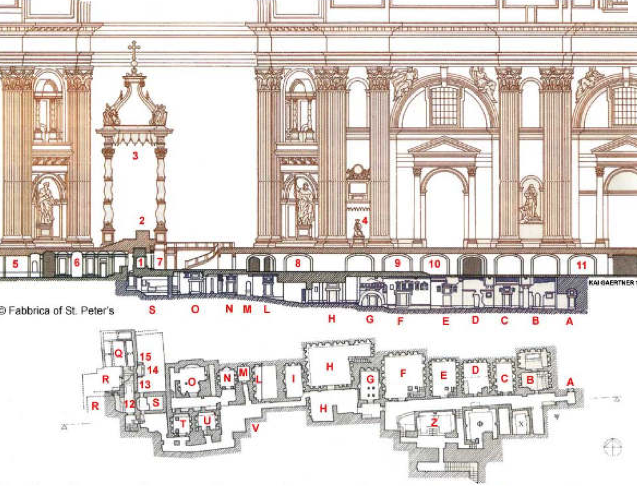 The Scavi tour concluded in the grotto of St. Peter's Basilica, in front of the marble shrine to St. Peter designed to map out the placement of the artifacts of St. Peter's tomb directly behind it. I loved this tour, not only because it was led by a gorgeous guide from England who was attending his first year of seminary at the Vatican (as my grandma would call him, a future Father "Whatawaste"), but there's something wonderfully surreal and fascinating about walking on the same ground that was the original Vatican Hill of 2000 years ago. 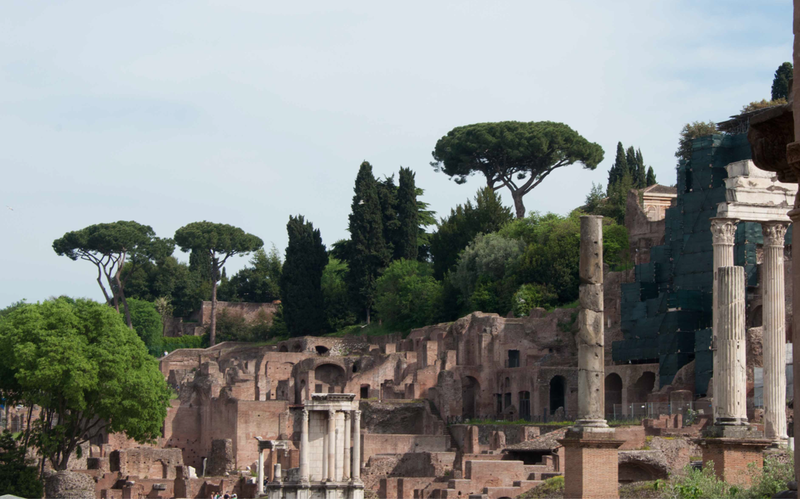 The remainder of our time in Rome was spent touring the famous Roman ruins of the Colosseum and the Roman Forum near Palatine Hill. Again, we opted for the physical guide over the audio guide at the Colosseum because it was not that much more expensive and provided the added benefit of a shorter ticket line. The extensive restoration of the Colosseum has created a real historical treasure. Our guide explained to us all of the technological and engineering feats that went in to building not only the stadium structure and all the marble attached to the building's skeleton but the extensive elevator system underneath the floor of the Colosseum that allowed for the easy delivery of props and animals used in the various events throughout the day. 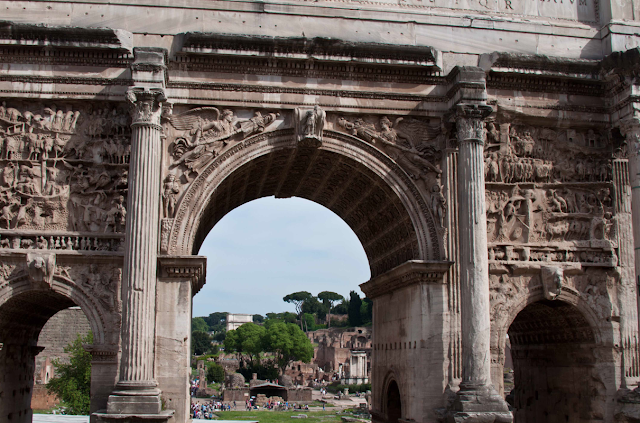 The Roman Forum is an overwhelming site, just trying to imagine the ruins as the multi-story buildings they once were so many years ago and, on a grander scale, as only a small part of this capital city at the center of the Roman Empire. You can buy books in souvenir stalls that provide you current photos with plastic illustrated overlays that give you a visual reference point. There are two entrances to the site that allow for a logical walking tour from Palatine Hill to the end of the forum ruins. 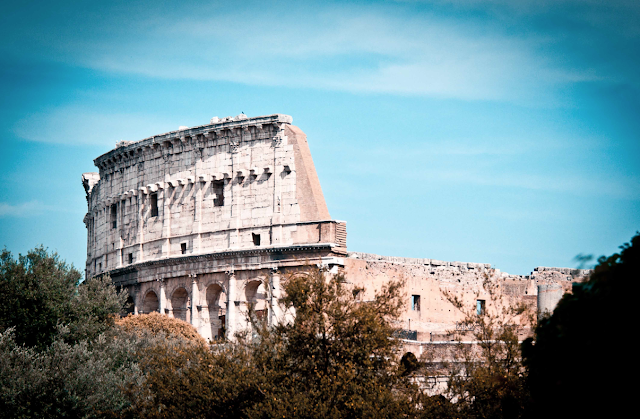 Well, as the saying goes, "Rome wasn't built in a day," but as we proved on this trip, it certainly can be toured in just a little over two days! And now I can officially check my box, having seen all of the major sites the city has to offer - even a Pope blocking my entrance to the Vatican the first time around.